Discussion in 'Ashra Spells' started by Lynsey, Dec 7, 2017. Warning about Ashra Impersonators and how to avoid them! 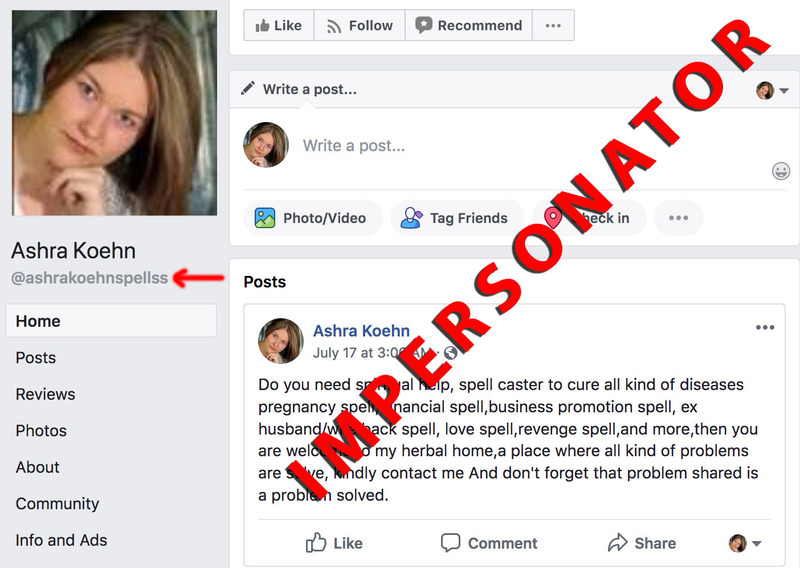 Please know that Ashra Koehn is so successful with her spell casting that she has MANY impersonators. They may not only be using her name but they are stealing her spells and creating their own websites! Please be weary of any websites with pop up ads. Ashra Koehn has her own personal websites where you can contact her so that she can suggest a spell that's right for your situation. The real Ashra will NEVER manipulate or force you to spend money. She cares about her clients and puts her clients' needs first. A lot of Ashra impersonators are using Money Gram and Western Union. Be weary of any websites created in Nigeria. Dr. Nana has stolen “Passion Panacea” and you can find that on lovespell.tips. We all know Ashra created that spell herself! There is also an African spell caster named Prince Zayn who has an “Ashra love spell” for purchase on www.princezayn.com. That is a big red flag! Another impersonator that was just recently found is a lady going by the name April who has a website that was created in 2017 called www.solutionsandlovespells.com (Solutions and Love Spells). She has a gmail account which is easily created. That is something to be weary of. If you look over her spells she has not only stolen The Golden Kiss, Freedom Fire breakup and Hearts of the enchanter spells but she copied the details of each spell that was written in Ashra’s own words because she was the creator of the spells. Ashra Koehn usually responds back within 72 hours from the time you requested her services. She follows up with an automatic confirmation with the details that you wrote in your email, a receipt and another email to register your information if you haven’t already. If any information is left blank she will contact you asking for you to provide that information. She will ask for your birthday and first and last name. That is to help make sure she is connecting with the correct person. By researching Ashra’s forum you will find that she has a couple of different emails due to the high volume of clients she has. It helps to keep her organized. She will not send random daily emails in a template form. Her emails are personal. Avoid any website that directs you to another website to make purchases. Avoid websites that are sloppy and poorly written. Ashra will never tell you that your spells will backfire because her spells do not backfire. That is another red flag! If you contact Ashra through email or by selecting contact Ashra from this forum you will get the right Ashra. Some people contact Ashra via email yelling and complaining to her when she doesn't respond right away. Please understand that she is only one person but she will definitely get back to you. Its nearly Christmas, so I can only imagine how many people are asking for her help before the holidays. If you contact Ashra and she says that she didn't receive your payment or info to cast a spell, than be 100% sure you contacted an Ashra Impersonator and she will be glad to work with you and fix the issue. Ashra Koehn is a true Angel on earth and she is here to help you. If you have been scammed by an Ashra Impersonator please make sure to share the information on this forum so that we can all be aware. Make sure Ashra is aware of any impersonators so that she is able to go after them legally and have them taken down. ashrakoehnspelltemple@gmail.com : This Ashra Impersonator is notorious for sending out email spam to everyone! They send mass amounts of spam emails that appear to be coming from ashrakoehnspelltemple@ashra.net, but when you look at the reply-to field, it says ashrakoehnspelltemple@gmail.com. So by replying to the email, you are actually sending your message to an Ashra Impersonator and not the real Ashra Koehn. The list above will be updated when new impersonators are exposed. At first I went to type in Golden Kiss because I wanted to see if I could get a spell cheaper than Obeah but powerful. When I scrolled through I certainly found Astra's site but the titles of the spells she uses are on this site too. Oh God! I checked the websites! They both have gmail accounts! The easiest way to steal your money and get lost! How can someone use the name of a real person for a spell? Ashra seriously the lawyer should do something about this! The second has the same names as Ashra in spells when Ashra has been for years even on internet! So she has the names of the spells long time online! And she started this year online! I can guess why! And WHAT prices?? She wants to become fast reach and disappear! I wish and hope people don't fall in their trap!! This is crazy!! I'm not surprised that fakers are impersonating Ashra because of her near 100% success rate, but I am shocked that they are doing it. Not only is this tarnishing Ashra's good name, it's also ripping off customers and they think that it's the real Ashra Koehn doing it!! This is absolutely absurd!! Ashra is such a sweet, kind, caring woman, and she is my friend!! I have become a much better person with her spells and services, and I hope that these impersonators all go down hard for stealing her name and spells. Ashra Koehn will always be #1. I cannot believe that people are impersonating Ashra, honestly some people need to get a life. Ashra is a great spell caster and a psychic and she is dedicated to her work, some of her competitors cannot accept that and wanna try stealing her clients by impersonating her. Ashra Koehn is such a gentle kind woman who wants to help us all,I hope that these impersonators get caught and get punished for trying to ruin Ashra's reputation. I think that the people attempting to impersonate Ashra have nothing better to do with their lives, and its clear that they are not raking in any clients other wise they wouldn't try to steal Ashra's. If these people claiming to be spell casters had genuine services and their spells actually worked then they would not try to be someone else just to try an make themselves more popular. I really hope no one falls for these impersonators making out to be Ashra Koehn because that really isn't fair on Ashra and it is certainly not fair on the people who contact them about their services. Before I first emailed Ashra. I did a serious investigation back then because almost everyone is saying different things. I was so confused that I even check the facebook account and youtube testimonial (to be honest, I'm really thankful for the videos because of this I was able to believe in Ashra before I contact her). That's when I knew that I should believe and contact Ashra for the first time. However, while waiting for her reply, I read some reviews that other spellcaster ask their client to sabotage and give bad review for Ashra as their payment. I'm sorry I can't give the link since I forgot where it is and I can't find it. I can feel that the client back there was feeling guilty and apologized for giving a bad fake review about Ashra even though he/she never tried Ashra back then. I'm lucky since I contact the right and real Ashra, but I'm afraid somebody already falls and contacted the fake Ashra. I think that explains the bad fake reviews going on. I hope everyone who will seek help from the future to be extra careful who to contact. I hope they will able to contact the real Ashra. I know that Ashra just really want to help people and really kind. I knew that when she first emailed me. I just looked at April’s site solutionsandlovespells.com and not only did she steal 3 of Ashra’s spells, The Golden Kiss, Freedom Fire Breakup Spell, and Hearts of the Enchanter, but she’s made them so overpriced. For the Golden Kiss, it is $275. That’s more than a triple cast for the Golden Kiss by Ashra. Then she charges $500 for the Freedom Fire Breakup Spell. And last, $1,500 for Hearts of the Enchanter. This is just unrealistic and that costs more than the Obeah Love Spell which is the most powerful spell offered because of its abilities. You can tell that this person is a scam because nobody in their right mind would pay so much just for a standard spell. She’s truly just out for your money. I hope some action is taken soon about this website and that it will be shut down so nobody can be tricked. I dont understand these people, dosent they have conscience. We all have different problems and hope for Ashra help. You can’t build success in some other name and steal her hard work. Dosen’t they now what comes around, goes around. Ashra is kind, she is nice and caring, she can make you feel so much better. And you can really get help. I hope people don’t fall for these frauds and liars. Thank you so much for the information you have provided . This is indeed helpful and very valuable. I think these people are just jealous of Ashra because she is a genuine spellcaster and not fake or scammers like them. They wanted to ride on Ashra's popularity and damage her reputation at the same time. I hope people are not going to believe these scammers. It is awful to take advantage of one's sufferings. We all know that Ashra Koehn is not a scammer. Heck! if she was, she wouldn't have tons of reviews and testimonials from happy clients, nor would she have returning customers. This forum wouldn't have so many people on it saying that their spells worked; not to mention, all the new members that are creating new accounts and reaching out to Ashra for her help. Take this info with a grain of salt; Ashra Koehn is very real; I'm seeing positive outcomes in my situation, after nearly 3 months of working with her, and I am saying that she is very real only because she is. What these Ashra impersonators don't know is that we know how the real Ashra's schedule is: She may take a little while to get back to us if we email her because she is very busy, all while the scammers will answer immediately because they want your money. *Also, do not buy any services from ashraspellstemple.com. It is ran by someone in Nigeria, and they use a Yahoo.com account. This person is NOT Ashra Koehn!!! Unbelievable some lengths people go to Ashra has a really good success rate plus a good relationship with her clients and she has genuine client reviews. Jealousy is a horrible thing! How dare they do this to Ashra and try give her a bad name. I know to be really careful how I contact Ashra and I do know my emails are from the genuine one as it's been stated she personalises your emails just for you. I hope Ashra is onto these scammers and will shut down their sites. I really hope no one falls into their traps and think it is Ashra she would be deeply upset that a client has fallen foul to them. I can’t believe that people are actually impersonating Ashra. I really hope no one else finds them and believe that they’re the real Ashra Koehn. More people that really need help from a real spell caster should find Ashra’s real websites and emails because she’s a real spell caster and doesn’t pretend to be one like others do. I can honestly see why there are people impersonating Ashra. She has a high success rate which is bound to attract clients to her website who are more than willing to actually pay her and some people are desperate for money so they scam people who are hurt and looking for help and end up getting hurt from these scams unfortunately. I can't even begin to imagine how these people must feel once they discover they must have been scammed by an ashra impersonator. Not to mention the fact that it absolutely destroys her credibility because these people may not even realize that they were scammed and in turn blame Ashra fully unaware that she has no clue what happened with them. I truly hope Lynsey that your post and this thread you created helps people know the difference between Ashra and the scammers to prevent any of this from occurring again. I still can’t believe that there are people that are impersonating Ashra. That’s really horrible! People will think they’re the real Ashra and say that her spells don’t work. I really hope no one else will find them. They need to find the real Ashra. Ashra will never lie to anyone and won’t trick anyone. She actually wants to help people. Wow That's very crazy that someone would want to impersonate Ashra. Especially since she wants to help others from the goodness from her heart. Well at least I have come to the right place and was able to email communicate the real Ashra. I really look up to her because no matter whatever anyone says about her or even tries to do. I haven't seen or hear her reply back with any negativity. Yes, everyone is right. I have seen a few sites stating that they are her too. She has such a great and wonderful heart that is so incomparable to. I thank her so much for willing to help me. This has helped me so much at least I know if I am talking to the real Ashra or not THANK YOU SO MUCH !! Many people have reported being contacted by Ashra Koehn on Facebook. However, there is an Ashra Impersonator who just created a facebook account within the last week and is using the Account to trick people into think that they are Ashra. I've attached a screenshot below... notice that they added as extra "S" at the end of "ashrakoehnspellss". This person is not me. This is a scammer using my photos to impersonate me. Neelam and Nintendofan3 like this. Ashra, I am so sorry that is happening. People can be down right horrible. I haven't noticed that one on facebook, but if I see it I will definitely report it to facebook. Fakers can be really hurtfull. No one needs that type of negativity in their lives. Don't let it get the best of you! Oh my... @Ashra , that is just unacceptable!! I thought people stopped impersonating you. Thank you very much for informing us. We will be careful so we will know if it is really you or not. I hope that account gets deleted soon once it gets reported. There is only one Ashra and that is no other than you. No one can ever replace you. The real Ashra Koehn on Facebook is "AshraKoehnSpells". Chances are this Ashra Impersonator is located in Nigeria, Africa or some other country were they can get away with this illegal act. @Ashra , Oh I see... Noted. I shall report it to Facebook too. Those impersonators can never get away with their bad intentions and actions, wherever they may be in the world. Keep on doing good work. We will always support you for helping is all. All your good deeds are greatly recognized. @Ashra Thank you for keeping us updated of what is happening. Its good that they are not trying to contact me. But I feel sad because they need to do such thing. They don't have anything to do in their place. Maybe this is their job to make easy money. I do hope that this will end and other will be alert of this wrong doing. People will always pul you down no matter what good deeds you do. That is why I let this people do what they want from me because one day. Everything will be out in their sight. What I mean is there is alloted place for them. If you can report this to facebook, they could easily get this people out of FB. @Cheryl77 , same. I also even asked my brother to report it using his account. Let's continue to spread the word so we won't be victimized by scammers and Ashra's impersonators. This impersonator is really silly to think they can fool those who know the real Ashra Koehn. I for one would not believe that this fake profile is Ashra with that spelling and grammar. Ashra is on point with her spelling and grammar AND she has great professionalism. The way she responds to her clients is always in a professional manner. This fake profile has none of this, horrible spelling and grammar, does not at all sound professional and it’s really giving Ashra a bad name if anyone who doesn’t know the real Ashra contacts this fake profile. Whoever created this fake profile they’ve got to be Indian, Nigerian or African or something. I can always tell by the spelling and wording due to my past experience with contacting numerous spell casters before finally finding Ashra. I hope the person behind this fake profile gets hit with a good dose of karma. This fake profile will effect a lot of upset people just wanting real help. Hey. I've seen that page awhile ago on facebook. The first time I saw it I already knew that it was an impersonator who wants to take advantage of Ashra's credibility to collect money from them. I hope people who saw it will not be victims. Impersonators have no hearts, they don't know how we suffered then they will just fool us for their own goods. I hope these people realised that what they are doing is wrong. Public Warning: Ashra Impersonator on Twitter - Scam Warning! Why... of all people, why do people use your identity, @Ashra ?? This is unacceptable..!! We should report that account as soon as possible. Hi Ashra, I'm so sorry someone is trying to impersonating you. Ashra you deserve the highest respect for your love and hard work. I'm not on twitter but i would surly hope twitter take the matter serious. Here we go again! I could understand why they want to be you, because you're in high demand with your success rate. Thank God you are able to catch these worthless people in time. I'm always so greatful you keep all your clients in high alert. I'm sorry for the people who gets fooled by your pretenders. Let's hope together we can help spread the word to protect your good name. YOU DON'T DESERVE THIS! you're to kind and caring for this treatment. Sending love. Thank you for the support from everyone on the community. If anyone knows how to report them to Twitter and Facebook, please do! I will certainly return the favor for the removal of their page. I just sent a report to Twitter about this imposter. Hopefully with enough of us reporting it they take this person off Twitter. And put a stop to it for a little while. There are so many Ashra koehn impersonators and it make me feel sad that these poor people think it is acceptable to steal someone's identity and use there name for money. I also find it sad that they don't have anything better to do with there time so they steal Ashra customers and give them terrible experiences in Ashras name when it isn't really her. This is horrible for Ashra for people to think she's a lair wlair when in fact it is people impersonating her because of all the success she's had. I hope people find the right Ashra in order for them to get the required results that they so despratly need. I wish this would stop for the sake of Ashra and these poor people how are falling victim to these fake spell casters. Thank you this has really helped. I had tried to find Ashra's real site to where she has her spells and have been checking to make sure I found her email. I can not believe that there are some people like them. I know that Ashra Koehn is a very popular and successful spell caster but these people are horrible. How can they do this to Ashra Koehn? They are just jealous of Ashra and they want to take the clients that Ashra Koehn already has. They are not real spell caster but fake. If they were real then they had not copied Ashra Koehn. I have never encountered a fake Ashra before and boy am I glad I haven’t. Whenever I purchase spells they are always from Ashra’s website or a link she sends in an email. People should be ashamed that they have to impersonate someone else. And the dead giveaway that they are in Nigeria? Psh. We all know Ashra is located in Australia. Anyways, I hope people stop messing with you and other people’s feelings! I actually found one on facebook and reported it. The spelled spells with a z on the end. I recognized it right away as a fake account and reported it that way to facebook. I hate that people can openly lie like that. I'm sorry you have to deal with that Ashra. You know I have and will back you up. I have done it in the past, and will if you need it in the future. Best wishes.